Nurtured little sprouts can grow into foodies and chefs! When I was a kid it was common for my peers and I to be commandeered as helpers in the family garden. Some people just had window boxes to worry about, but my parents were always keeners and we rented a duplex with a yard. Our back car stall was converted to a veggie garden and that became my number one summer chore. 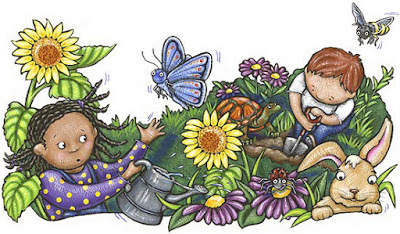 I learned quickly that gardening was not for the lazy, but I also learned that fresh peas and beans and carrots that I helped plant and water and pick were much tastier and more fun to eat than store-bought items. There wasn’t a farmers’ market where I grew up, but I did learn about where food came from at an early age. For the past five weeks I have been working with local chefs as part of a program that helps kids today learn how much fun food can be. Growing Chefs was started in Vancouver in 2005 as a way to transmit the knowledge and share the passion of chefs and growers to kids in urban settings. This is the second year for the program in Kelowna and classes in Comox and all areas of the Lower Mainland are participating as well. 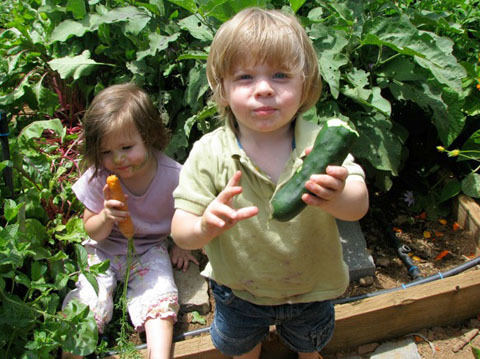 Last year over 120 volunteers helped 850 students to experience the fun of growing their own food. In a regular classroom we can only do so much, so I hope that the spark has been ignited for these kids. Maybe they will ask a grown up to take them to a farmers’ market or stop at a fruit stand. Perhaps they will try growing plants in a patio pot or on a windowsill. Hopefully the flavours excited them enough to make them want to explore with their tastebuds too. Today we made salad dressing from scratch and had them choose ingredients from a salad bar we set up. I loved seeing them – some liked the taste of the dressing on mixed greens, others liked grated beets and carrots, and then there were some who liked the crunchy sunflower and pumpkin seeds. The best part was seeing almost the whole class excited about salad – imagine that! At Rabbit Hollow this summer we’re going to explore the farm-to-table idea with families in some of our events. We will literally take ingredients from the farm to the table, picking them fresh and then working with them in our backyard kitchen and tasting them at the harvest table. Parents and kids will be encouraged (even pushed if necessary) to work together and play with their food. We hope they will find out that it’s more fun (and tastier) than opening a box from the freezer. We can all do our part to contribute to a sustainable environment and a life eating real food. Simple things like visiting the markets in summer will open your eyes to local wonders, I promise you! If you have kids, maybe we’ll see you at Rabbit Hollow this summer (just contact me if you want more information). If you are interested to volunteer for Growing Chefs you can check out their website; they also have great information on planting suggestions for the urban gardener. And if you’re just a big kid like me, then perhaps I’ll see you at one of the local markets or fruit stands. 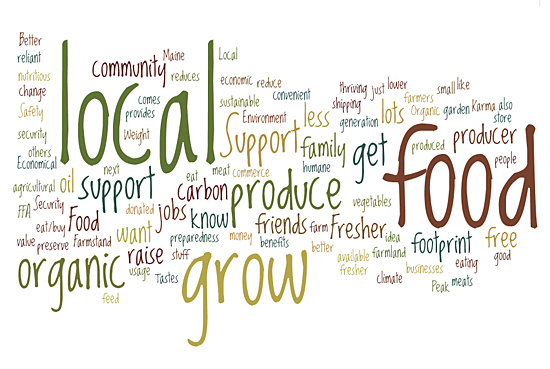 Check out Soil Mate if you are looking for places and ways to connect with fresh food in the Okanagan. With the May long weekend just past, the “outdoor season” has begun. That means dinners on the deck and drinks on the lawn and hanging out in the sun. I enjoy time outside in my garden too, putzing away at picking veggies, weeding to keep things tidy and generally being at one with Nature. Sometimes it can be a bit much though… I don’t have many lazy days outdoors, but that is my own fault. My most daunting task at Rabbit Hollow is to pull weeds – it seems every year we have a new species that wishes to be counted in the general population. 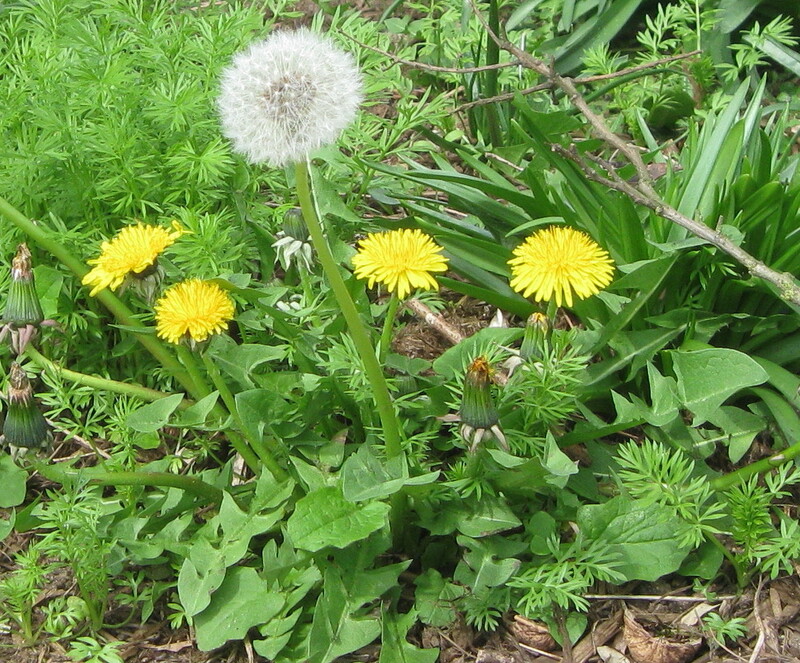 I was perhaps over-exhuberant when we had a friendly neighbour turn over a section of the front yard, as it is a patch twice the size of our kitchen and with spring rain the weeds take firm hold. 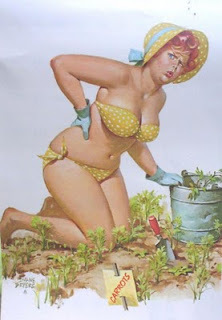 I exhausted any frustration I had about life in my hoeing and pulling of weeds. Then my sense of accomplishment was fulfilled as I planted row upon row of my wacky vegetables. By the end I had sprouting purple carrots, bull’s blood beets, rebel radishes and arugula all ready to reach for the sun. I flopped down on the grass very proud of my efforts, but longing for the days when they didn’t wear me out so much. This was, I remembered, only the first item on my full page to-do list. After a few minutes respite, it was back to work so I pulled out the weed eater and tackled the two-foot high crab grass beside the garage. 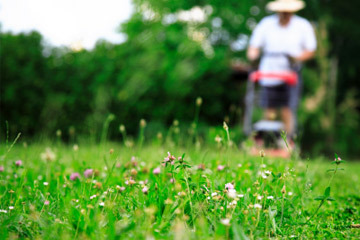 As the freshly cut bits of grass stuck to my legs and I smelled that aroma of dirt and grass, memories came flooding back to me as I walked along of childhood summers doing the garden chores. Ah, the peace of the days when having green feet and a tank top tan were the worst of your worries! There is something pastoral about a quiet day in the sun with Mother Nature and her creatures. I sat on the grass and slurped my popsicle, and soaked in every aspect of the moment. It does my soul good to watch Simon and Ella wrestle till they drop in the just-mowed grass, and to hear the birds chirp as they chase each other over the lilac trees. I am very grateful that we have a little corner all our own, and I much prefer those noises to the hustle and bustle of the city. For you city slickers, maybe a pot on the patio is enough to fulfill your gardening curiosity, and a visit to the farmers’ market in support of local growers is more your kind of thing. Ultimately, I think the secret lies in finding your own peace, a place where the world stops still for you so that you can just breathe it in and smile. There is a great effort to support local businesses especially when it comes to food and often supporting “organic” is seen as a good sign as well. But when we talk of manufactured brands, do we really know where the brands come from? This infographic below shows a bit of “behind the scenes” info on who owns what. I don’t mean to pass judgement on any of these companies, but as the article from TakePart states if we wish to make more of a statement we need to make sure we learn about all the steps in our food’s progress to our table. Now that the farmers’ markets are opening up and the fruit and vegetable stands will soon follow, it becomes easier to support local growers. How many of us also support local producers when we buy meat or cheese? Do we shop at a local independent store or a large national chain? Do we support brands based in our own country, or province (state)? Often supporting a local effort means paying a bit more… is this decision one that we feel is worth the extra pennies? I grew up in a time when food from countries halfway around the world was more expensive and not always available. Nowadays many of those items are always on the shelf and at a price that doesn’t change much (kiwis, pineapple, asparagus and strawberries in winter, citrus fruit in the summer). 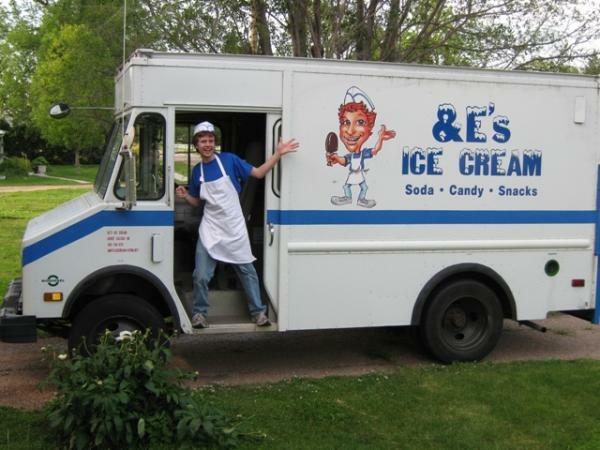 Big box stores didn’t exist either, and my parents knew the butcher, the greengrocer, the fish monger and the baker. At Costco or Walmart no-one asks to speak to those people, but they do expect the prices will be much lower than at the little local shop – the big guys purchase items by the container-load, so why wouldn’t they be? I guess it comes down to value… how much would you spend on a pair of designer shoes or an outfit? What brand of smart phone do you prefer? If food is a priority, then likely you spend accordingly to find what you want. What is good wholesome food worth? The same goes for supporting local; is your community something you value on a personal level – do you want to know and support your neighbours? It truly is up to each of us to decide, hopefully in an informed way. To borrow the phrase, “take part” – get engaged so you can defend your choices and live with a happy conscience! I wish I could say the Lilies of the Valley in my yard look this beautiful… I have the sunshine but the stems are just up, no blossoms yet. Still, I rejoice in their effort, their enthusiasm and when the blossoms arrive, the fragrance! 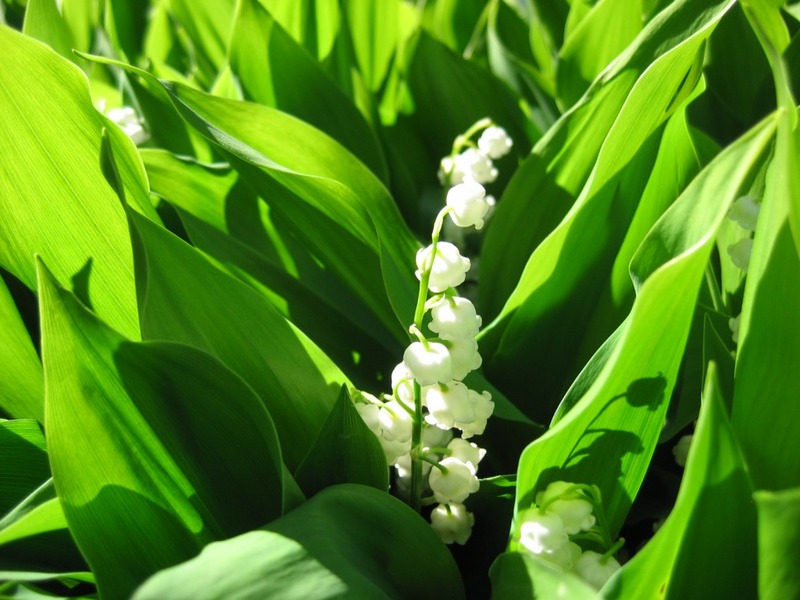 Lilies of the Valley are an ancient woodland flower, and have signified humility in religious works for centuries. Personally, they make me think of fairies and other magical things. It’s not surprising that they are a prized flower in a bride’s wedding bouquet – Grace Kelly had them when she became a Princess, and so did Kate Middleton when she became Katherine, Duchess of Cambridge. 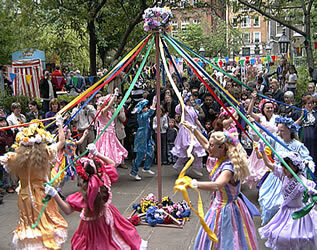 So, on this beautiful day, where I am surrounded by sun and blooming flowers and fresh-cut grass and bouncing animals, I wish you a Happy May Day. Here’s to the sun prevailing.